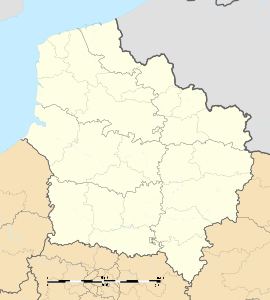 Ailly-sur-Noye (Picard: Ailly-su-Noée) is a commune in the Somme department in Hauts-de-France in northern France. The commune lies about 20 km (12 mi) south of Amiens and about 13 km (8 mi) from the border with the Oise départment, situated at the junction of the departmental roads D7 and the D26, in the valley of the river Noye. Annual Son et Lumière Le Souffle de la terre narrates the story of the people of Picardy from Gaulish times up to the Second World War. More than 450,000 have been to see the spectacle. Water sports on the lake area. Motocross club on two different courses. 45 separate clubs and societies participate in the life of the community. Wikimedia Commons has media related to Ailly-sur-Noye. This page was last edited on 4 February 2019, at 14:25 (UTC).